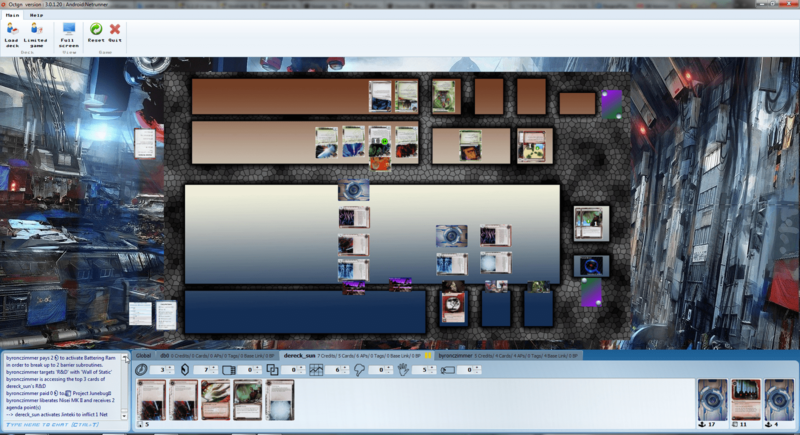 I mentioned a while ago that the first and most basic version of Android:Netrunner has been released on OCTGN, and you haven’t really heard from me since. Well the reason is that I was too busy coding improvements for it. I think it’s time to give my latest creation the usual treatment and announce it here. So Android:Netrunner is a new reimplementation of the Classic Netrunner, but given a really good polishing in the rules and art by Fantasy Flight Games. The game has not been released yet1 and it already seems like it’s going to be a runaway success! There an absurd amount of excitement for the new version online and the game has been sitting in the hottest games of Board Game Geek for weeks now. It’s sitting in the second rank for customizable games, even before people has a chance to really make decks with it. The game is a unique blend of asymmetric gameplay combined with a significant element of bluff. This combination, along with the Cyberpunk setting and the (now) Noir flair of the Android universe, makes it a very interesting and exciting game to play. At the moment of release there’s going to be 7 factions to play with. 4 Corporations, and 3 Runners. One of the runners is even going to be an anarchist2 playing around with computer viruses. The game comes out with 113 unique cards which is light for a first expansion, but not particularly limiting. You can check out this thread for some in-depth and in-flavor analysis on the runner factions. I’ve played about 8 games on OCTGN until now, just with the starter decks, and I’m really liking what I see. The feeling I get when I play this game is that it has more cohesion within each faction. They each have a specific style of play that they favor and their faction cards complement it. In deck construction you can use cards from other factions to complement your strength and perhaps even do something completely uncharacteristic and throw your opponent off. I think this cohesion is good because it allows some natural balance as it’s impossible to defend from all angles, so it comes down more to whoever can use their limited tools and some good bluffing to avoid exposing their weak points and hit their opponent where they can defend the least. The Jinteki Corporation VS a Shaper runner. The runner has just stolen an agenda and the Jinteki is punishing her by doing net damage. Once you find someone, one of you hosts and game and the other joins. Leave the two-sided checkbox checked and make sure that whoever is going to play the Corp is set as player [A] (the host can click on the letter to switch it) and once the game is started, load your starter decks. Things should be fairly intuitive but keep in mind these basic things in relation to the OCTGN engine plugin. At the start of your turn, declare it with F1. If you’re a runner, start a run with [F5] – [F8], or by playing cards. Once your run has ended, finish it with [Esc] is unsuccessful, or with [F3] if successful. Double-clicking is your friends. Almost everything you want to do, you do it by double-clicking on the card in question. There’s a lot of other tricks you can use in the engine and most of them have been put into the “Did you Know” starting tips. So pay attention and you’ll be flying through the controls in no-time. Any new innovations I add to it, are also going to appear in the changelog and future MotDs, so you’ll know when good stuff has arrived. In fact I’ve been coding like crazy for the last few weeks, much to the annoyingment of the wifey. So much so that I’m starting to feel like this. Coding an ANR plugin is kinda like this. There’s already a large group of players using the Android:Netrunner OCTGN plugin daily, since unlike my other plugins, this game is hot stuff. You’ll find a lot of potential opponents to test your deck-building and bluffing mettle. Any advice for scanning cards? How do I get them into the set? I'm brand new to OctGN, I have a scanner (though it's not great). My friend and I just followed this guide and tried to play last night. While it was mostly great, we would often get python errors that had something to do with a value being null. Times we got this errors included deck setup (ctrl+shift+s) it was also not shuffling our decks or auto-drawing our hands (which i think it is supposed to do?). Other times included the runner action to look at the top x cards of r and d. Any ideas? Thanks. Did you download and install all files? There should have been 3 of them (Game definition, Markers and Core Set). If yes, what version were they? The set ‘Markers’ is incompatible with the installed game version. Set made for version: 1.0.0. The markers are taken from the ANR part of OCTGN forum. Without them, when I try to set-up in-game I keep getting python problems, I don’t get cards to hand etc. You have an old markers file. Download the latest. Yes, that’s what I’ve thought. The problem is, I don’t know where to get them from. Like I’ve said, those are taken from the glued topic on ANR sub-forum called “Game & markers”. Your plugin looks very beautiful, I’d play ANR through it gladly, but do not really know how. Have you thought about writting a more clear, step by step guide for those, like me, that never heard about Octgn before? Obviously, there is one in the very topic I’m replying to, regrettably it is written from a perspective of a Octgn user: you write about downloading patch and do not mention what to do with it, there is this marker thing and no instruction where to obtain more updated ones and how to install them. I’ve checked the git-gub repository, those there also seem to be outdated. I’d appreciate some more guidance. I don’t have time to write a more detailed install guide I’m afraid so I’m relying on the community. Some others have done some videos and written some articles but none on the installation afaik. Mostly on how to use OCTGN to play the game. To be fair, the installation is not that complicated. You didn't install the markers, this happened to me also. Downloaded the files, but can't find the .o8g file anywhere in the bundle…? I am having problems finding a .o8g file also. I have no experience with OCTGN (I downloaded it just to use your plugin, after seeing it in action on Youtube). I downloaded the zip from the link above. What am I doing wrong? I’m sorry to say, but you’re using a bad browser. Do not use Internet Explorer because it *renames* the .o8g file you’re downloading to .zip without telling you. Tried playing with this today and got tons of errors. Also being unable to inspect your opponents cards is a real hassle. Turns out we were using it incorrectly – we had only run the game setup for one of the players. Cheers on the inspect tip, but why isn’t it part of the ordinary right click menu for them? First: ANR is awesome on OCTGN. Thanks for all the work! You may be confusing two different things here. The game definition does not have to be uninstalled before you reinstall, but there is a bug in OCTGN which requires that you do not play a game before installing the new version on top of the old one (https://github.com/kellyelton/OCTGN/issues/655). To work around this, simply restart your OCTGN before installing the new version. There’s also the sets patching, which does not require that you reinstall your sets at all. When I build a deck at ‘cardgamedb.com’s deck editor’ I cannot use it at octgn after the current update. Do you know why? Any hints how to play with these decks? Can you explain how you cannot use it? It works for me. Perhaps send me a link to your deck on cardgamedb? No worries, I think I’ve traced and fixed this bug already. Aqui você encontra lojas no Brasil com frete grátis, pronta entrega e 3x sem juros,Lojas de Replicas de Relogios Premium AAA.